One of our biggest issues with the ‘read later’ service Instapaper was the way it handled multi-page articles. Previously, you had to save each page individually, and if you didn’t notice at the start that it wasn’t a single page, you had to juggle saving the multiple pages within the Instapaper app. Now, the bookmarklet used to save articles for later reading in the app has gotten a nice update that supports multi-page articles and changes the way that it notifies you an article has been saved. The previous little “Saved!” frame had a great run, but its time has passed. Readers are now saving more pages than ever on tablets and phones, and the old bookmarklet wasn’t visible enough there. Instapaper’s customers would often complain that they didn’t even see the old bookmarklet working. The new style is a full-window overlay that leaves you no doubt the article has been saved. A nice touch. The multi-page support is fantastic and a welcome addition just as the new Readability app for iOS arrives, making me jealous with its handling of multiple page articles. 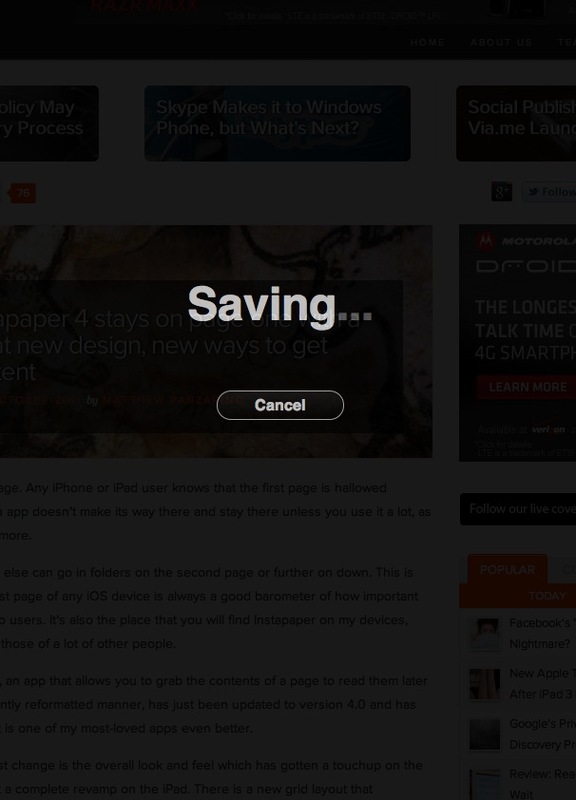 If you’re an Instapaper user that saves a lot of articles, this is a nice tweak. Better yet, the upgrade to the bookmarklet was done on Instapaper’s servers, so you don’t have to re-add a new version, it will just work this way the next time you save an article.